The Raisin Girl responded to my ramblings about Prom Queen by writing a Tumblr post, and I responded to it in the comments, but this has stuck with me and I thought it worthy of its own post. Oh. The way he at Kurt and said “I can’t,” which COMPLETELY ECHOED what Kurt said to Mercedes at the beginning of season one…it was just too much. I may have cried, not just from the incredibly poignancy of the moment but because I feel that character’s pain on a very real, personal level. I understood that “I can’t” and it felt completely genuine to me. via The Raisin Girl, Response to “Deconstructing Glee”. So I had to go back and look (I know, I know, torture). So yeah, in “Acafellas”, Kurt confides for the first time in anyone, that he’s gay. 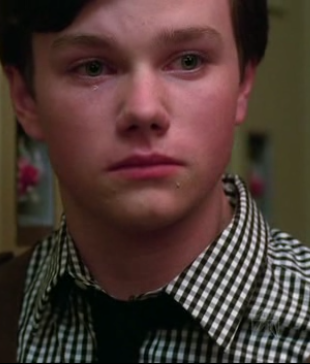 And Mercedes encourages him to come out to the Glee club, but Kurt says, “I can’t”. Side note: I’d forgotten how much he freaking killed that scene. 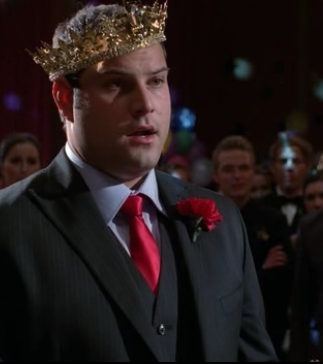 And now, we have Karofsky in the same place. Kurt’s encouraging him to come out (I love Kurt’s personal brand of insanity where he genuinely believes that’s the moment), but Karofsky isn’t ready. I want someone more skilled with video editing than I am to splice these together. And something I haven’t had the time to do is go back and watch and see has Santana said the same. I’m sure she has. I’m also not working tomorrow. Can’t imagine how those two things are related, but watch this space, I might have an update. In the back of my mind I noted that the same words had been specifically stated by Kurt in “Acafellas,” but hadn’t thought much more on the situation. And I believe that Santana has uttered those words while standing at her locker…though I can’t be all together certain. Either way, I have great hopes for Dave. Santana bowed out of doing fondue for to by sending Britney a text that only said “I can’t”. She may have also said it. I hadn’t made this connection, but I had made a connection between Santana’s text and Karofsky’s I can’t moment. The “I can’t” catch is amazing. I think it speaks, particularly, to the now-ness of the central dilemma here. I mean, I was never really in the closet as a teen, but I was also never really out. I didn’t understand it as a rite of passage, an obligation, a “this is what you do and doing this is useful” even if I came of age about my queerness as a teen around things like “Act Up.” For me, speech was defiant and confrontational and a usurping of adulthood and sort of untoward, which is really not at all what coming out means in the culture now, or for these characters. When Kurt comes out his voice is so quiet; Blaine is defiant how? through excellence? Santana is defiant pretty much in opposition to her sexuality…. My point is, I don’t think the idea of “coming out” was necessarily floating around straight/mainstream teen culture amorphously in the mid-80s, but it is floating around all of our cultures now. We know what this act is; we know that it’s central and basic and no more defiant than saying out own names, even if it’s still terrifying. So I think part of what makes the Glee queer story lines work isn’t just the agony and drama of the bullying plot, but having this very simple, central thing to hang all of it on: speak. Or, in the case of this show, sing. It’s a powerful synchronicity and one that I think highlights the gap a lot of people feel between the weight of the queer plot-lines and those of the rest of the show. Glee works best when it’s about truth and the risk around truth. It’s why all the queer kid plot-lines shine. And it’s why the recent Sam plot-line also shone. And the rest, as much as I do often care, doesn’t always need declarative (and therefore musical) moments in the same way. Which means the rest of the show is fun, but isn’t integrated with the musicality of the structure in a way that, to me, is intrinsic to what the musical should be: a world where people burst into song, because there is no other choice. That lack of choice and the need for song is always there with the queer narratives and wobbles around wildly when it comes to the rest of the show. “because there is no other choice” actually sums up all of what I love about Glee. Brings me into the pages of A Single Man I’m trying to memorise (for no good reason) at the moment. About how he wants/needs to speak. I have nothing more to say. There’s just so much in that want/need/imperative.